"Hey PX This. 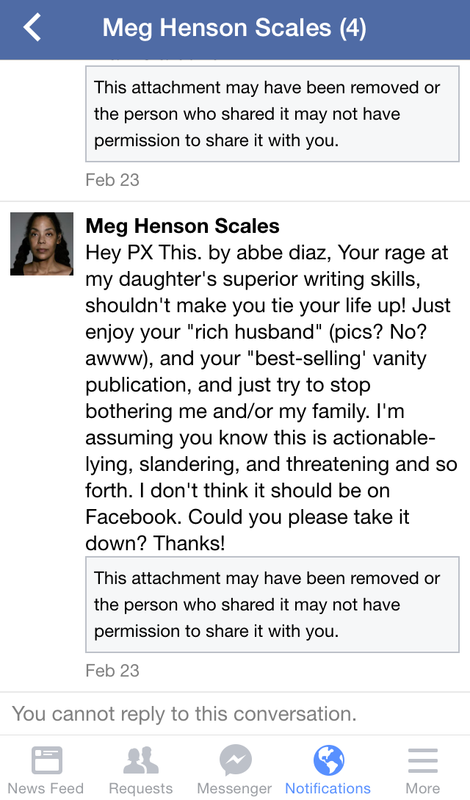 by abbe diaz, Your rage at my daughter’s superior writing skills, shouldn’t make you tie your life up! Just enjoy your ‘rich husband’ (pics? No? 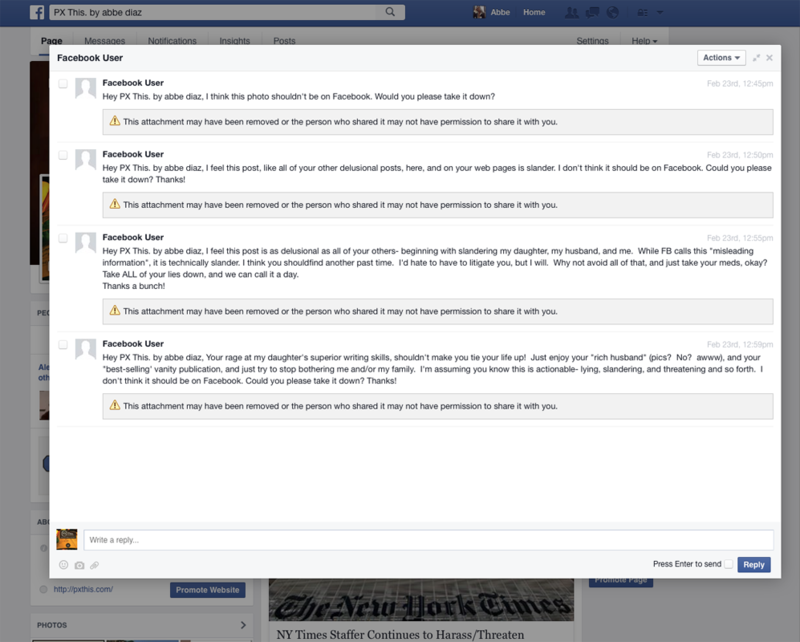 awww), and your ‘best-selling’ vanity publication, and just try to stop bothering me and/or my family… "
"Hey PX This. 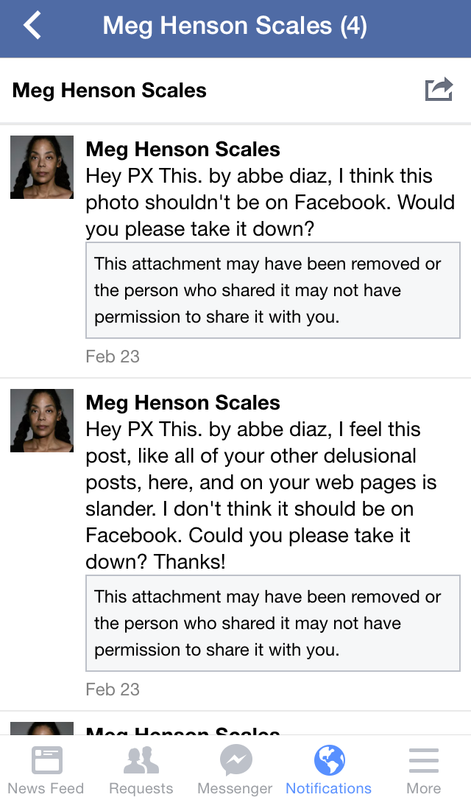 by abbe diaz, I feel this post is as delusional as all of your others… I think you shouldfind another past time. 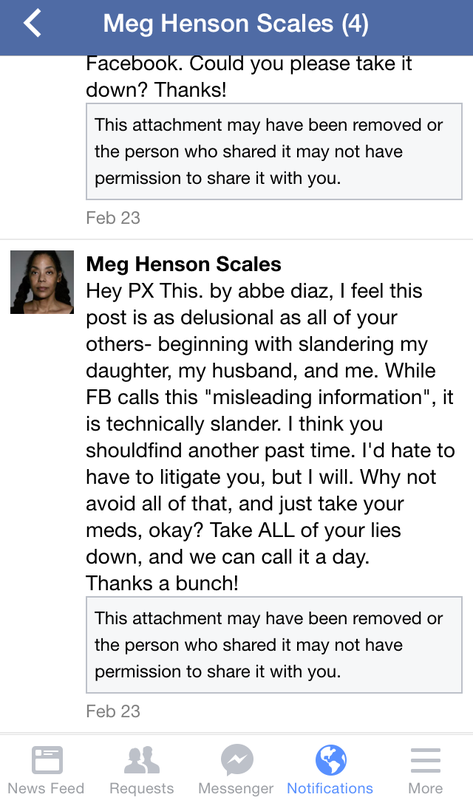 I’d hate to have to litigate you, but I will. Why not avoid all of that, and just take your meds, okay? 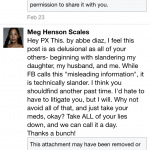 Take ALL of your lies down, and we can call it a day…"
However, as before, it would appear that the Henson-Scaleses had a change of heart about openly conceding their cyber-harassment, as the Facebook page for Meg Henson-Scales has evidently been deleted following the dispatch of their latest communications. 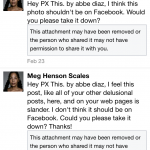 Much in the same way that they suddenly began masking their IP address with a free proxy server, they have now apparently attempted to retract their latest statements by deleting their associated Facebook page. This latest communication has been added to the ongoing Aggravated Harassment report filed with the Detective Squad of the NYPD. • In March of 2008, the dubious New York Times essay by “Coco Henson Scales” is published in a collection of short stories edited by Ira Glass, titled The New Kings of Nonfiction. The book fails to disclose in any way the relationship of the “essayist” to a New York Times staffer. 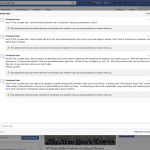 • On June 17 2015, the harassment of Diaz continues via popular Q&A website Quora, where Diaz is designated a 2014 “Top Writer” and has over 2.7K followers. 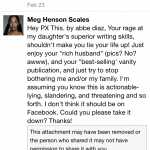 Although published here on the PX This website, the message was promptly deleted by Quora administrators upon its discovery, and anonymity privileges were revoked against its registered user to prevent further abuse of the social media platform.